Unique wedding cake designs are a continuing trend. We’ve seen cakes drenched in chocolate, covered in fresh flowers, and monogrammed with the couple’s initials. Some are more elaborate, with lighted fountains, multi-shaped tiers, or trimmed in lace or jewels. 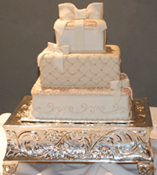 The single most enduring trend leading into 2008, based upon online searches, is the square wedding cake. Some choose to adorn the cakes with traditional icing. Others have their square cakes arranged and iced like stacked gifts with bows and “wrapping paper” designs (the picture at left is an example), drenched in chocolate ganache, adorned with a flower cascade, or otherwise decorated with unique or funny designs. You can also borrow from the cupcake idea and arrange individually iced mini cakes onto a square, tiered cake holder. i agree that square cakes are becoming more common in weddings. as a cake designer though, i find it more challenging to cover a square cake than a round one.